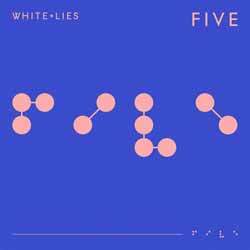 For those who have been following White Lies over the years you'll need no encouragement to buy their latest LP, Five. For those who have been in a cave on the moon for the last decade, the band deliver a retro sounding '80s vibe. If you lived through that decade (as I did) then this captures the energy, glitz and glamour of the then emerging music technology and '80s fashions. It then presents it in a way that is instantly accessible to a new, modern audience, whilst at the same time creating waves of nostalgia to 40-somethings. The album contains 9 songs (42 min, 05 sec) and opens on the right note with 'Time to Give', which perfectly sets the right mood for what the rest of the album has in store. Songs like 'Finish Line' and 'Kick Me' will instantly bring to mind the work of Morrissey. The tune to 'Tokyo' will be rattling around in your head for ages, while 'Denial' and 'Believe it' have more of a rock feel to them. An enjoyable and engaging album that you'll get hours of listening pleasure out of.